Wow, this book is humongous. When I first saw it, it reminded me of the 3-volume Complete Calvin and Hobbes because of the sheer size. This hardcover measures almost 30cm by 30cm. Fans of the Mouse Guard comic series are going to enjoy this a lot. The book has 368 pages and it's packed with artworks such as sketches, pen and ink illustrations, painted art, photographs of David Peterson at comic con and photos of miniature sets of interiors and buildings that were used as reference. This book gives you a detailed behind-the-scenes look at the making this series from 2005 to 2015. When I first read the comics, I was transported to another world. I feel small like a mouse because the comic was drawn at mouse eye view. It's really interesting because there aren't a lot of comics that give you this sort of perspective. Also, the artworks are awesome. They are now printed huge in this book. You can go through them slowly and admire the strokes, the details and how well each panels are carefully composed. Some panels are reproduced from the comic books but they serve to let you view the art at a much larger size. Often, they are accompanied by pencil layouts so that you can compare the two. David Peterson provides first hand account on the storytelling and drawing process. There are lots of insights, especially when he talked about research and how he build those miniature sets. I didn't even think about how he drew those interiors when I read the comics. Overall, it's a great book. 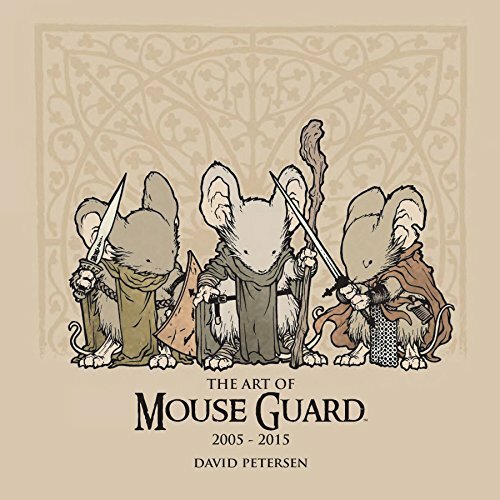 Highly recommended to fans of Mouse Guard.